In the developing world, small businesses face a number of obstacles that their counterparts in developed countries do not. At Paper Craft Africa in the Bwebajja neighborhood of Kampala, Uganda, Harriet Nantale oversees a bustling workshop. Outside, employees soak and recycle paper, banana fiber and pineapple fiber, creating thick sheets of paper in vibrant colors. Inside, the team uses the paper and other recycled material to craft calendars, notebooks, cards, jewelry, soap and other gifts. Paper Craft Africa’s products are sold in local hotels and gift shops. The company employs 25 people, many of them young, single mothers. “The business has been able to give them a source of income,” says Harriet, Paper Craft Africa’s production manager. Small and growing businesses like Paper Craft Africa hold the potential to drive economic growth that can transform poor communities. But in the developing world, small businesses face a number of obstacles that their counterparts in developed countries do not — a lack of information and business skills, few role models to emulate, difficulties accessing finance and markets. My vision is to become one of the biggest recycling companies in Africa. This week is Global Entrepreneurship Week, a celebration designed to inspire people through special events across more than 125 countries. For TechnoServe, Global Entrepreneurship Week offers the opportunity to recognize the critical role of small and growing businesses — and the enterprising people who drive their success. 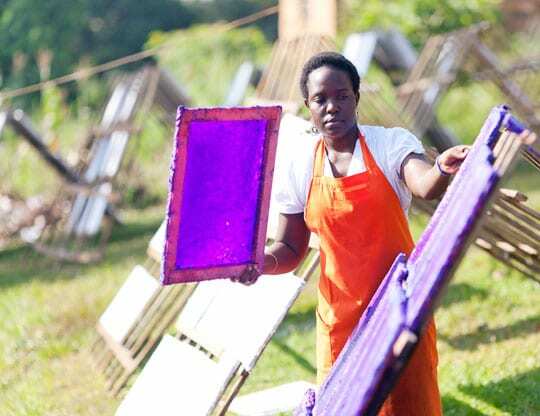 In Harriet’s case, she participated in a TechnoServe program called Women Mean Business, which aims to empower women in the Kampala area with the knowledge and skills they need to grow thriving businesses. Harriet and her staff attended monthly training sessions and received coaching from a local mentor in key business skills. The knowledge allowed them to make improvements in areas such as bookkeeping, marketing and human resources. The program also exposed Harriet to other local women entrepreneurs, whose experiences offered valuable lessons. “From the knowledge we learned, we were able to employ more people,” Harriet says. Now, in the second phase of the Women Mean Business program, TechnoServe is working to understand how to provide support to women like Harriet in the most efficient and effective way. In partnership with Innovations for Poverty Action (IPA), we are comparing the impact of two approaches to business training — a “light touch” approach consisting of only classroom training, and an in-depth approach that combines classroom instruction with intensive coaching and mentoring. TechnoServe will work with 400 businesswomen during the next two years. Using a randomized control trial methodology, IPA is randomly assigning women to different groups for light touch and in-depth support, along with an additional control group. Earlier this year, IPA completed a baseline survey of all applicants in order to help measure their progress after receiving assistance through the program. The study will help TechnoServe and others understand which model of support provides the greatest impact and cost effectiveness. So far, the clients have participated in trainings on finance, sales and marketing, and human resource management and customer care. TechnoServe is recruiting and training coaches from local universities, as well as established mentors from the local business community. The ultimate goal is to help these enterprising women build thriving businesses that create jobs and economic opportunities for their communities. Paper Craft Africa, for example, is helping more than 20 young mothers to provide for their children and send them to school. 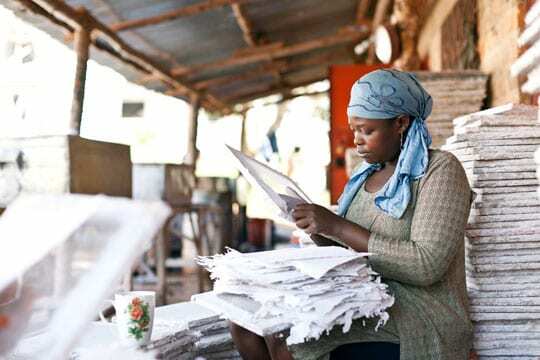 Harriet credits Women Mean Business with helping her to manage Paper Craft Africa with confidence — and showing her that she and her business can achieve ambitious goals. “My vision,” Harriet says, “is to become one of the biggest recycling companies in Africa."